With a tradition of history in the 1000 Islands running five generations deep, the 1000 Islands holds a special place in our hearts. We have created this gathering place for local residents & visitors alike to meet and enjoy the beauty of the River in it’s natural state. Perched on The River’s edge, The Ivy Lea Club is comprised of a Private Marina, The Ivy Restaurant and The Skiff Café & General Store. Plans are underway for a select number of residential River Villas. We welcome you to experience The River with us! The Ivy Lea Club is situated on the shore of the St.Lawrence River, in the heart of the 1000 Islands, just 10km east of Gananoque, ON. Nestled exactly half-way between Kingston & Brockville, we are a short 30 minute drive from each of these communities. EASTBOUND along the 401, take exit 647-648 to merge onto the 1000 Islands Parkway toward Rockport (east). Continue on the 1000 Islands Parkway for 10km. Turn right onto Shipmans Point Lane which marks the entrance to The Ivy Club Club property. Look for the 2 large granite rocks marking the entrance way and our bed of flowers in the summer months. As reference points, we are 2km east of The Glen House Resort and if you reach Pecks Marina you have gone too far. WESTBOUND along the 401, take exit 661 to merge onto ON-137 S. Continue on ON-137 S for 1km. Take the 1000 Islands Parkway exit toward Ivy Lea (west), and continue along the Pkwy for approximately 4km. Turn left onto Shipmans Point Lane which marks the entrance to The Ivy Club Club property. Look for the 2 large granite rocks marking the entrance way and our bed of flowers in the summer months. As reference points, we are 750m west of Pecks Marina and if you reach The Glen House Resort you have gone too far. NOTE: The Ivy Restaurant is the perfect stop for a bite when travelling along the 401 between Toronto and Montreal as we are a short hop and a skip from both exit 661 (6km) and exit 647-648 (10km). 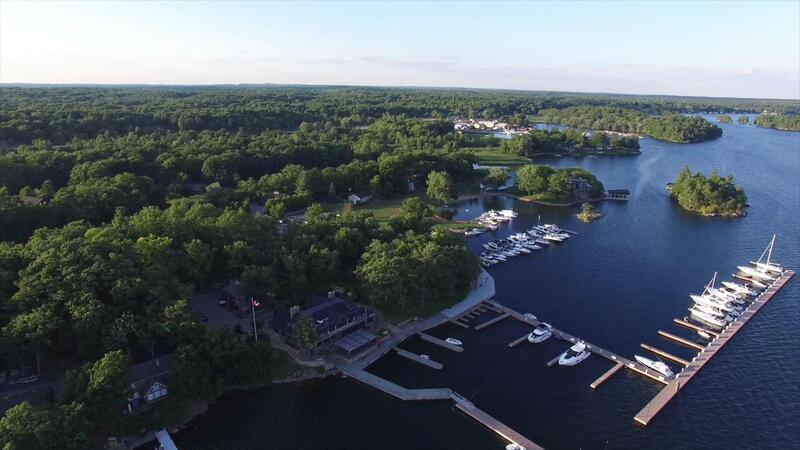 The Ivy Lea Club is located on the Canadian mainland along the main Canadian Channel between Pecks Marina and The Glen House Resort. It is located across the channel from Wellesley Island State Park, NY. We are approximately 0.75 nm North of Flashing Red H20 at Steeple Shoal. The Restaurant itself can be clearly seen from the water, and offers plenty of docking space reserved for patrons of the Restaurant only.NOTE: Overnight docking is prohibited.